Credit Michael Appleton for The New York Times. Richard Edwards, 68, was Friday night’s first karaoke singer at Joe’s Place in Parkchester, the Bronx. He said he hoped to perform for President Obama. Two hours into karaoke night, there was still no karaoke to be heard at Joe’s Place in the Bronx. Waiters carried out buckets of Coronas and shots of Coconut Ciroc to two dozen would-be singers settling in for a long night, in no rush to venture back into the sticky August heat. Small plates of empanadas and rice and beans were passed. Between tables, older women in revealing tops and strappy sandals swayed seductively to salsa and merengue beats. At Jessica Pedrosa’s table, there were a lot of drinks — and disclaimers — going around. “I like to sing, but I sound bad,” warned Ms. Pedrosa, 32, a social worker who came ready to sing anyway. “As long as I’m having fun, that’s all that matters. And of course, a drink or two might help.” She had enlisted her cousin and three friends for some mandatory singing, making sure that they did not back out by putting in song requests for each of them. “My friend James seems to be anxious,” she added. “I’m making him sing with me. I like duets.” That was James McCarthy, 31, a field technician for Time Warner Cable, who ended up at karaoke night instead of riding his new motorcycle to City Island. “Who doesn’t listen to songs in the summer?” he said. “You go to the beach; you bring your radio. You go to a barbecue; you bring your radio.” And his singing voice? “Horrible,” he said. 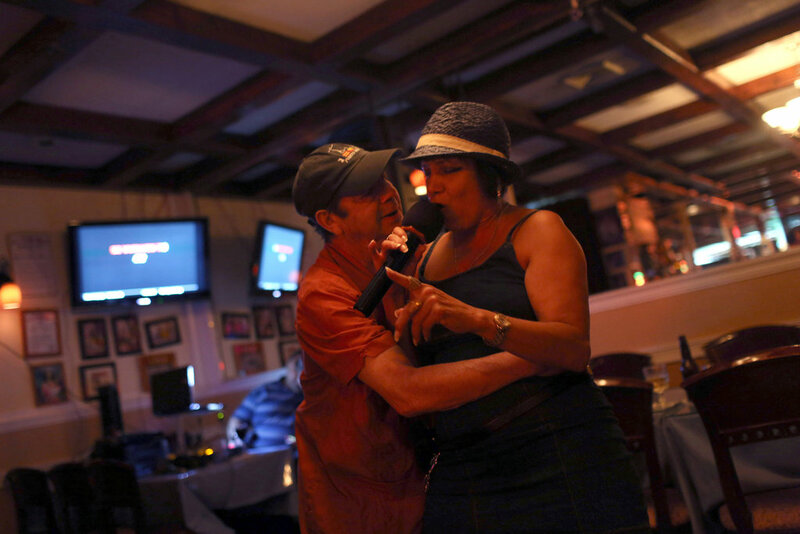 “We’re going to stink up the joint.” Karaoke, a staple of night life around the world, has taken root throughout the Bronx. Last fall it was added to the menu at Joe’s, a homey storefront Caribbean restaurant in Parkchester, where framed photos of Tito Puente, the baseball player Orlando Cepeda and Bronx politicians cover the wall. 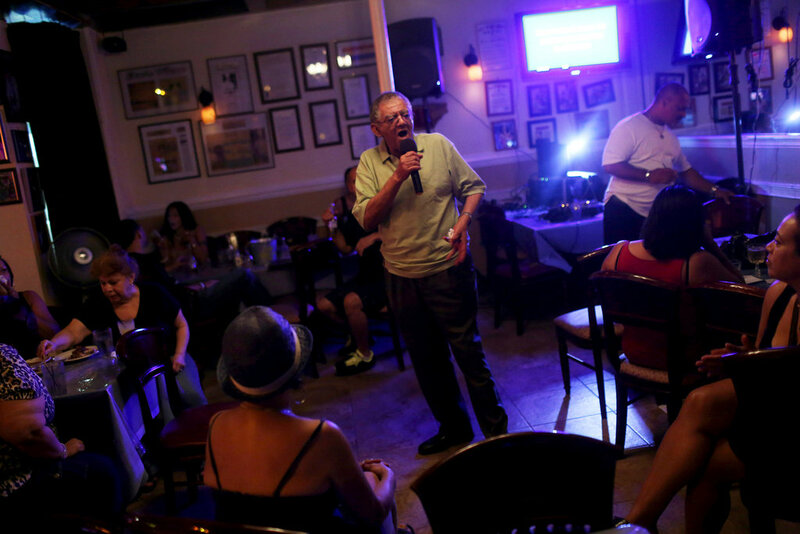 “You have to go with the times — this is what’s in,” said Joe Torres, the longtime owner, who turns his back room into a karaoke lounge every Friday at 9 p.m. On this night, the first of the performances finally came at 11:18 p.m. an unexpectedly sweet, yearning rendition of a 1961 Sam Cooke hit.“Cupid, draw back your bow and let your arrow go, straight to my lover’s heart for me, for me,” crooned Richard Edwards, 68, a retired train conductor who said he aspired to sing for President Obama. He never once had to look at the lyrics flashing by on a flat-screen TV. Mr. Rivera, 49, was the keeper of the microphone. A singer and D.J. for more than two decades, he helps draw a regular crowd of 20 or so singers, and maybe twice as many listeners on some nights. Picking through the song requests — Frank Sinatra, Kanye West, Lionel Richie, Spanish-language merengue — he kept the pace brisk and showed no mercy to newcomers. Monica Santiago looked up in shock. Under crowd pressure, she reluctantly accepted the microphone and tried a few lines of “Rapper’s Delight.” Her voice faltered, then trailed off. She tossed the microphone like a hot potato to someone else. “This is not my thing,” said Ms. Santiago, 38, a property manager, as she eased back into her seat. “Rapper’s Delight” kept pounding through the speakers. Not wanting to let a perfectly good song go to waste, the crowd came to the rescue. Sandra Batalla got up with her girlfriends. Others joined in. “It’s doing something out of the box,” said Ms. Batalla, 49, whose day job is surveying patients for a hospital. At 11:45 p.m., it was time for Ms. Pedrosa’s duet with Mr. McCarthy. Though it had been a couple of months since her last karaoke night, Ms. Pedrosa did not hold back on “Knock You Down,” a hip-hop and R&B number. And that was the way it went into the early morning: beautiful, heartfelt singing followed by raucous, heartfelt screeching. All the while, the drinks kept flowing. A version of this article appears in print on August 15, 2012, on page A17 of the New York edition with the headline: Heartfelt Singing and Screeching, Amplified.